05-Mar-2005 -- This dashpoint lies 1110 meters from Saaremaa, Sõrve säär (peninsula) west, in Baltic Sea. We tried to reach this confluence point after some cold weeks what covered northern part of Baltic sea with ice. But we were unsuccessful. West coast of Sõrve säär (peninsula) is open to the deep center of Baltic sea and there were too thin ice on the sea. We managed 110 meters from coastline to go towards confluence and then we saw some 25-30 meters of thin ice and ice banks and then open sea. 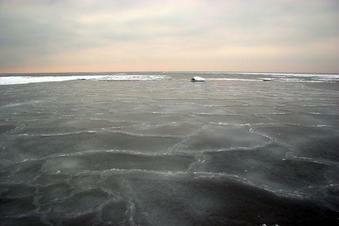 #1: View towards 58-22 confluence, thin ice and banks. #3: As far as possible from coast, but still 1000 m to confluence. In the Baltic Sea, just 1 km off the Sõrve Peninsula of Saare Island.